Current events are inconveniencing me, Readers. They are preventing me from splashing happily in my bath. They are keeping me from focusing with laser-like concentration on the frivolous, like the new makeup I bought Monday, after attending my high school reunion. Why after and not before, you might ask? Well, you might, except I’m not writing about it, due to my obsession with current events. Yeah, current events are jamming me up. I have to keep refreshing my Twitter feed because the conspiracy types are really getting me wound up. And the ones who are convinced we’ve become an autocracy on the way to full dictatorship are amping me up, too. Then I have to check in with Fox News to see what they’re saying, and then over to the failing New York Times and the Washington Post. It’s exhausting. All this energy expended in the mistaken, neurotic obsession, in the magical thinking that somehow, if I stay on top of new developments I will prevent something even more terrible from happening, or perhaps even solve our problems. All of which leads me to this grand point. Handling distraction - or not - is key to success. The latest news is today’s distraction. Tomorrow it might be something else. Please let it be something else, like buying makeup after my high school reunion, which was Monday’s distraction. That’s a much more relaxing distraction than worrying about the firing of the head of the FBI. Luckily, my scaffolding of success helped me out here. That is the point of the scaffolding. It helps you build success by providing you a structure to support yourself while doing so. Specifically, my like-minded others helped me out. We had our monthly conference call today. At the outset, my friend C (as in, we met in college) said to E and me that we could not discuss the elephant in the room, otherwise it would take up our whole time. But E and I both admitted that the elephant in the room had been gobbling up our attention. While we agreed not to talk about specifics, I suggested that discussing how to handle distraction seemed like a good topic. C responded that she had, in fact, not been distracted by this latest development. And indeed, when we three summarized our activities viz-a-vis our goals set at the end of our last conversation, of the three of us, only C had fully accomplished hers. Her secret to success? Simple. She had decided to stay focused with pockets of productivity. And the secret to those pockets of productivity was that she committed to using her better energy - during the day - for her work, and saving her checking in on the news for the evening. Talking to my like-minded others got me focused on my work today, and helped me resolve to use my better energy for my work, too. Talking to my like-minded others, a.k.a. 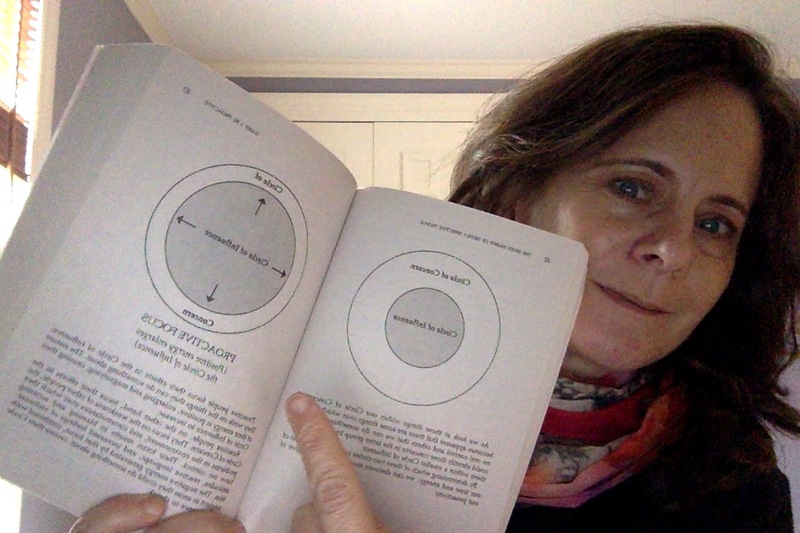 my loving mirrors, helped me activate another plank in my scaffolding of success: getting centered. Talking about using energy wisely reminded me that focusing on what I can actually do, as opposed to things about which I can do nothing, is the best approach to life. Worrying about what I cannot control is unhelpful. As Stephen Covey states in his 7 Habits of Highly Effective People, your circle of influence is smaller than your circle of concern, but is contained within it. I have provided a handy graphic for you in the photo below. Yes, I realize the text is flipped. That's a technical by-product of using my laptop camera. The point is the concentric circles. By focusing on what I can do, I can, over time, expand my circle of influence within my circle of concern. This does not mean withdrawing from current events, however. It just means allocating time appropriately. Making calls to my government representatives can happen in my low-energy periods. Meanwhile, I can focus my better energy on my work. Starting tomorrow, of course. Now, I have to check the news. I'm your loving mirror, Readers. That's why the writing is wackbirds. If you enjoyed this post, please share it with others! The buttons at the bottom allow you to post it on social media. Or you can email it to friends. Please sign up to receive my newsletter, which I send out via email once or twice a month.